To borrow from James Bond, "Nobody does it better!". And nobody does it like us. We are a unique fifth wheel company with a unique product serving unique customers. Very few weekend vacationers select us. Why? Because we cater to the needs of customers who are ready to leave their old lives behind and hit the open road, customers who are looking for a fifth wheel that will keep them warm, comfortable, and cozy for the next 10, 15, 20 years as their primary residence. 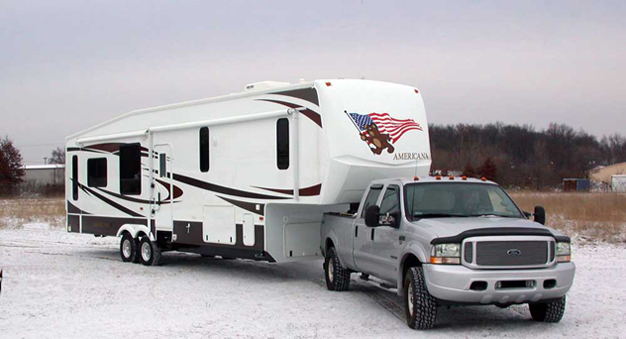 Full timing in your fifth wheel has never been a more popular option that it is right now. People all over the country realize that they can get more bang for their buck by joining the legions of full time RVers than from any other lifestyle. Following the sun, and their dreams, our customers get more out of life than just about anybody on the planet, and they do it in a fifth wheel specifically designed for their needs, the Americana RT Model Fifthwheel. How do we do this? Our engineering includes features found nowhere else, features designed to make your life of freedom comfortable, hassle free, and fun. We do this by focusing on quality, value, and innovation - all geared toward the needs of the toughest customers around - the full time RVer. Full timers know what they want. They have been around the block a few times and put a few miles under their belts. 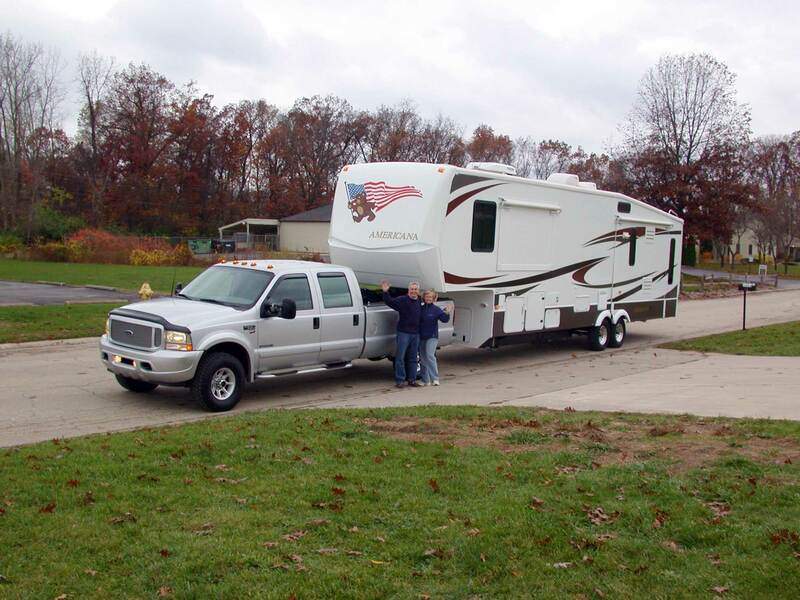 They are usually not first time RV buyers, and they are aware of what makes a fifth wheel a good value, what features are important for a life on the road, and what features are nothing more than eye candy and a waste of money. For thirty years we have been listening to the needs of our customers, and our current product is the result of paying attention to our customer's wants and needs (both the husbands and the wives). We offer unheard of features found practically nowhere else. Where else will you find an RV that can be equipped with self sustaining solar panels? Read a green report from our customers the Fairbanks to see what this could mean for you. Air Ride Suspension - Don't know why this matters? Once you try towing one of our fifth wheels with our air ride suspension, you'll get it. Hydraulic Disc Brakes - Safety, performance, and peace of mind. You'll never go back to any other stopping system. Four Seasons Insulation - Try being in 10 degree weather without it, or in 110 degree weather, for that matter. All of our models include these features - at no extra charge! At Americana, while our prices are extremely competitive, even against far inferior fifth wheels, our focus is on value over price. Nobody can beat the value we offer, especially for full timers and snow birds. When purchasing a full time RV, quality trumps everything else. And quality at a fair price? That's just a bonus - one we offer our customers. Live life on the road with all the comforts of home. Granite counter tops? We've got 'em. Instant, endless hot water? Got that too. Vessel sinks, Timken wheel bearings, LED Running lights....the list of unique Americana features and options goes on and on. Visit our Unique Features and Options page to see the complete list. Quality. Innovation. Value. It's the Americana Way. We build "tuff" fifthwheels for tough customers! "Our F350 and the new RT 38/39 SB model, "a true snowbird". Getting ready to head out from our Elkhart Indiana Upfitting Center for warmer climes at our Factory Order Display Location on the Colorado River in Arizona. We may be four seasons insulated, but most of our customers prefer sun to snow." Below is an e-mail from Colonel Alpo regarding his recent Americana Fifthwheel purchase. Be sure to read his full report of his buying experience by clicking here. Wanted to pass this article for the website to you before we get into the Holiday run-up with my 50 foreign officers. All is well on this end. Truck great, rig great. Gail and I went out to the RV campground last weekend and "winterized" the RV. Sent a couple of e-mails to Ron for advice (mostly on how to best get RV anti-freeze through the system --painless--thanks Ron). She is now in her site at the local campground (Western Village RV Park---nice folks and cool website) about 3 miles from the house. We unplugged everything and turned off the compressor (before I figured out we could've just turned off the red master switch in the basement--Duh). Solar panel/inverter keeping the batteries charged. Russ, if you want to use the article on the website, that is fine by us. We don't have any digital photos, so if you want to use the one from the website and add some of the ones you took while we were in Elkhart, that is fine by us. Have had a lot of ooh-ing and aah-ing from the full-timers at the campground and snow-birders headed south when they see the rig. One guy came in with a brand new $400k class A, berthed next to ours, came on-board our rig and started cussing like an SOB...the interior of his $400k coach looks like ghetto compared to ours and he was not happy with his return on investment. Needless to say, we told him all about Americana...maybe a future buyer!